Warnock: "You don't ever forget things like this, and we all have things like this happen in our lifetime." Photo: Aaron Chown/PA Wire. 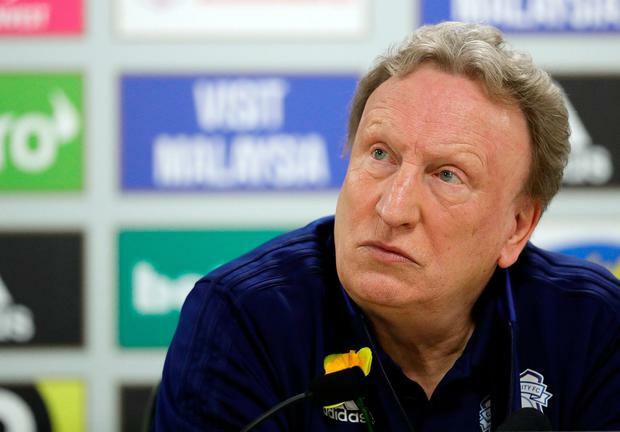 Neil Warnock accepts Cardiff now have to move on after the discovery of Emiliano Sala's body, which he says has brought "peace and comfort" to the Argentinian striker's family. Sala's body was formally identified by the Dorset coroner on Thursday, a day after it was recovered from the underwater wreckage in the English Channel. "While everybody expects the worst, when it happens (receiving the news that Sala's body had been identified), and I got a phone call last night, it was strange," said Cardiff boss Warnock. "It brings the family peace and offers them comfort - that's what my wife Sharon said from the start. Cardiff owner Vincent Tan said the club will continue to work with the Air Accidents Investigation Branch to determine the cause of the accident and pay for the cost of Sala's repatriation to Argentina. The Welsh club have asked the Premier League to let them again wear commemorative shirts at Southampton today. Last weekend's 2-0 win against Bournemouth saw Cardiff play in shirts with a yellow daffodil on them, Wales' national emblem and the colour of Sala's former club Nantes. Both Southampton and Cardiff will wear black armbands and a minute's silence will be observed. Nantes and Cardiff are involved in a dispute over the Sala transfer, with the French club having demanded the first £5.27million instalment be paid within the next week. Cardiff have withheld payment until they have clarified the facts surrounding the documentation of the transfer.